Following up on its doom-death full-length Reduced to Sludge released in 2011, Funerus surges forth with three new tracks on a 7″ entitled The Black Death to be released on Dark Descent Records within the next few weeks. This short work shows that where Reduced to Sludge finalized the Funerus style, newer works further intensify the strong doom-death sound which has propelled this band for decades of enjoyment in the death metal underworld. Sounding very much in company with widely varied acts such as Divine Eve, Cianide and Asphyx, Funerus writes grinding death metal riffs which develop over the course of a song with hints of melody and layers of texture, building an incrementally crushing atmosphere around a strong theme. 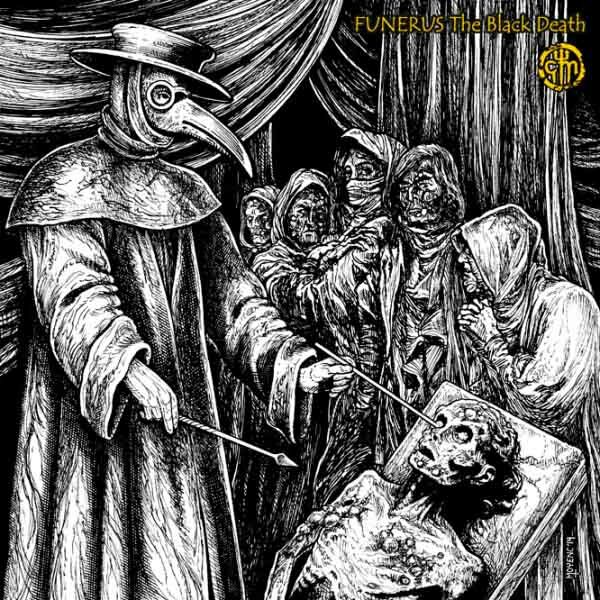 On The Black Death, melodic elements serve a stronger role but entirely without becoming fluff or reducing the impact. Funerus uses melody in death metal correctly, which is to underscore the evocative vocal rhythm of a chorus and bring out variation in riffs so that repetition increases the crushing sense of morbid doom instead of adulterating it. These songs build like the experience of descending into a deep cave, with the heaviness of the air growing more oppressive and the fear surging with each foot further into the void that return from this abyss will be impossible. Where older Funerus relied on more varied technique and sometimes conflicted with the pure power of its doom-death riffs, this new incarnation clears out everything but the essentials and uses them to complement the fiery riffing to give it a further sense of oppressive hopeless violence. In addition, vocals provided by bassist Jill McEntee, who shares instrumental duties with her husband John McEntee of Incantation, both through clarity of production and greater savagery produce an effect of urgent despair like chanted emergency messages broadcast by loudspeaker in the ruins of a dystopian city. Of the three tracks on this album, “The Black Death” grinds almost like a Bolt Thrower track but builds to a staggering sledgehammer doom-death riff instead of a melodic counterpoint to the abrasive chromatic dirge. The second track “The Minding” applies a melodic Swedish-style death metal riff much as might appear on a Carnage or Amorphis record but throws behind it a bulldozer of rhythmic momentum. Closing out the record, “On the Edge of Death” charges more like early Asphyx and keeps the intensity higher at a mid-paced speed with relentless vocals calling forth like battle command. Together these three tracks show a streamlined, stripped-down and more articulate Funerus that intends greater malice and achieves a sound competitive with the best of the underground that shows us this band at its greatest power yet. This is good news. Jill seems to have recovered. Looking forward to new Funerus stuff. One of the few bands still keeping up the underground spirit.